I took a bit of a blog break to travel to Florida to attend my nephew’s graduation. It was great to be with all my siblings and my mom. So…have you ever had an unintended painting project? I did…..yesterday. 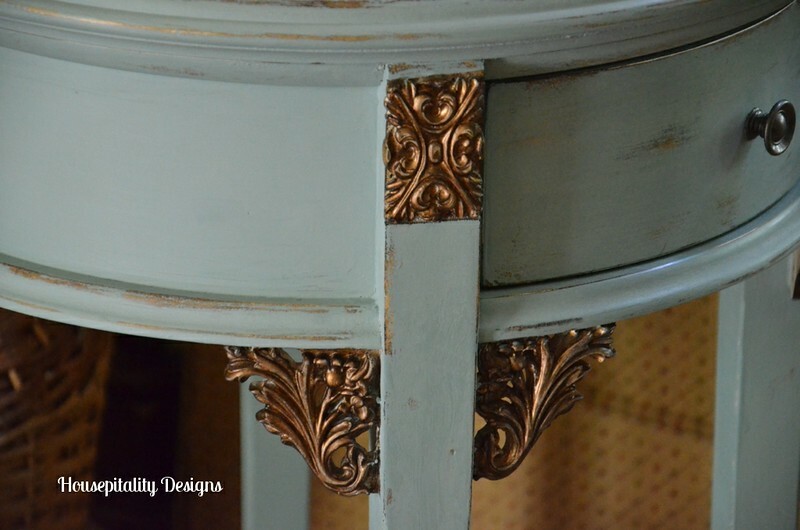 The original table…I decided it needed a facelift…..an overdue update.. But not this much blue!…. 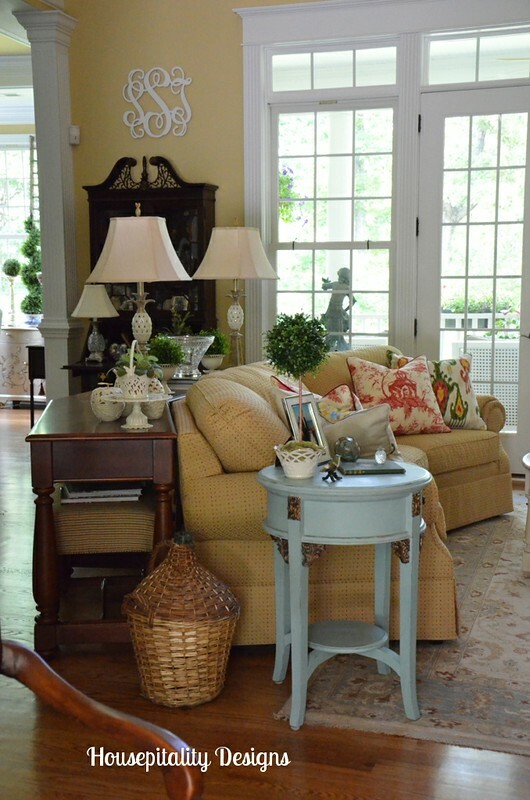 I truly love the color…Annie Sloan Duck Egg..
After I made the decision to take the table out of the room, I shopped the house. There was a table in my hubby’s office next to his chair….it was my late mother-in-law’s. I realized that the combination of the wood and cream tones of the marble top might work. I truly feel this table works better than either of the two. 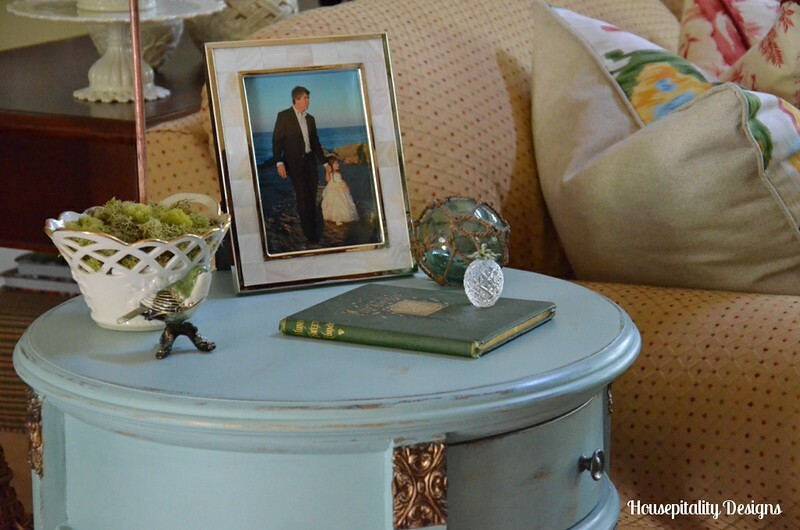 One of my very favorite pictures remain on this table along with my antique “Home Sweet Home” book. 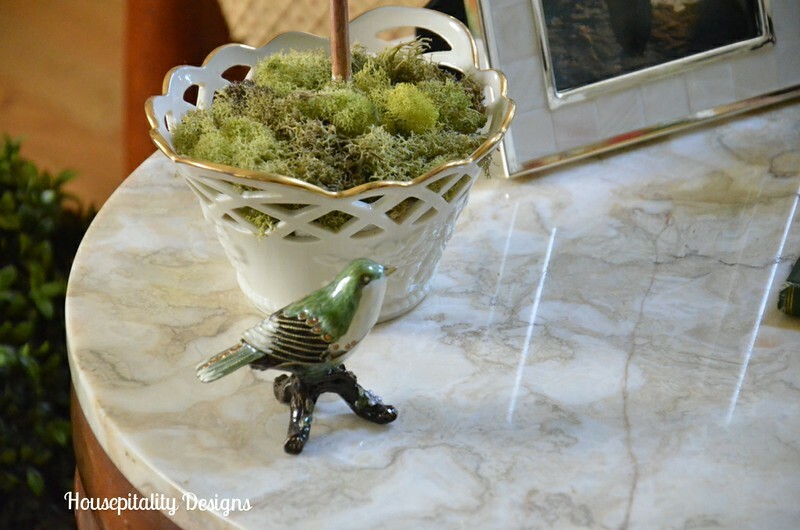 I love that the beige and cream tones of the marble go so well with the new fabric of the chair.. I am happy with the change…so “all’s well that end’s well”…. …..I need to move three things around to create a new home for the table…. So, have you had any “unintended paint projects”?? ?…or was it just me?!! Nana Diana’s recent post…UH-OH SHE’S BACK! LOL, I’m still trying to get to my “intended” paint project, Shirley! You’ve used one of my favorite colors on that table. I find that the dark wax helps to tone down the brightness of the color, although it is pretty without the dark wax, too. That is the color I used in my master bedroom on a few pieces. 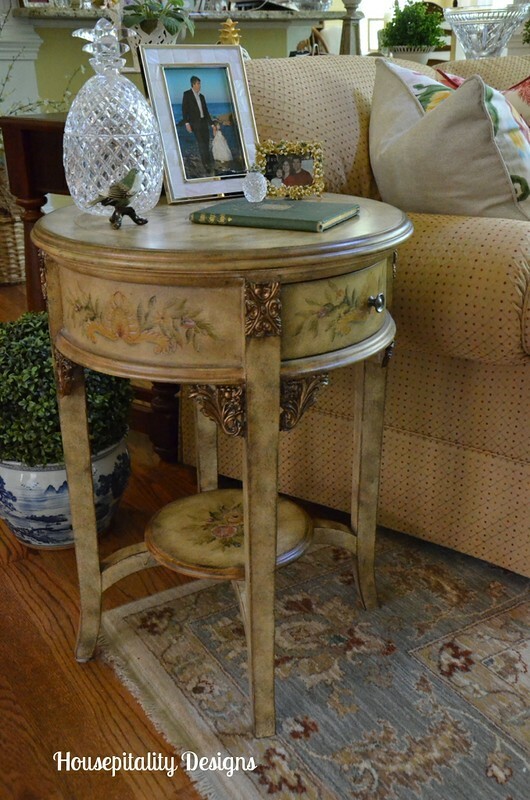 I kept my side tables from becoming unintended paint projects by covering them with dropcloth table skirts, otherwise they would have been painted, too. Can’t wait to see where it wound up! Loving that table and can’t wait to see where it winds up. The marble on that table is very pretty. Ha, I kept scrolling back and forth between the two tables, trying to figure out how you went from painted to stained! Helps to just go ahead and read the explanation,doesn’t it?! 🙂 I do like the marble topped table better in that spot. Can’t wait to see where the pretty blue one ended up. You’re right Shirley…that table is perfect there! 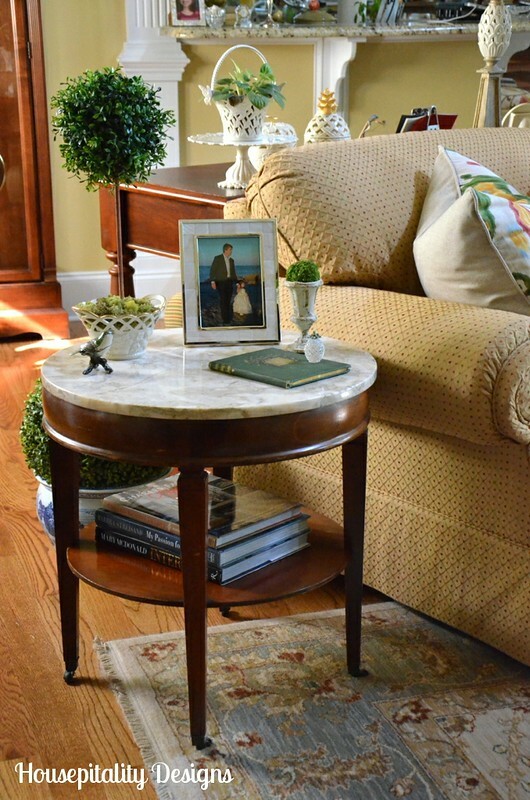 I do think your Duck Egg table is super cute and you did a fantastic job making it over, but that marble-topped table is just made for that spot. I’m glad that you had a nice Memorial Day weekend! We ended up going to the beach one day, but not to Charleston (long story). 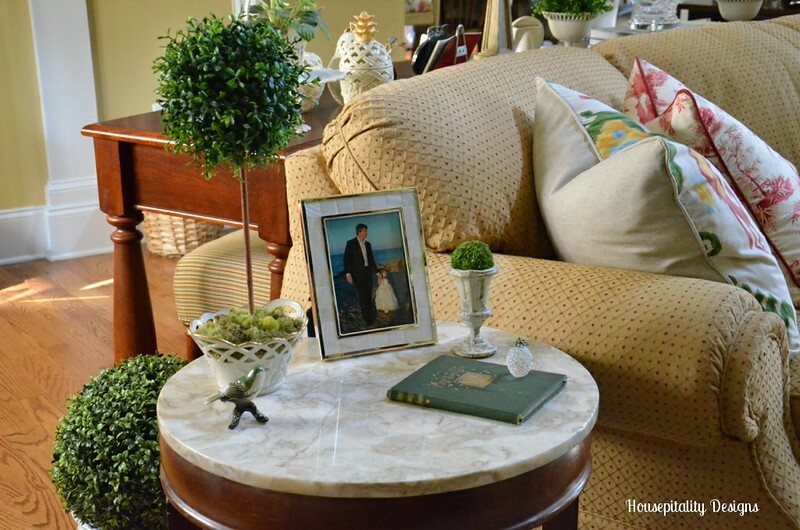 Love the marble topped table and that picture of hubby and G daughter together is precious. 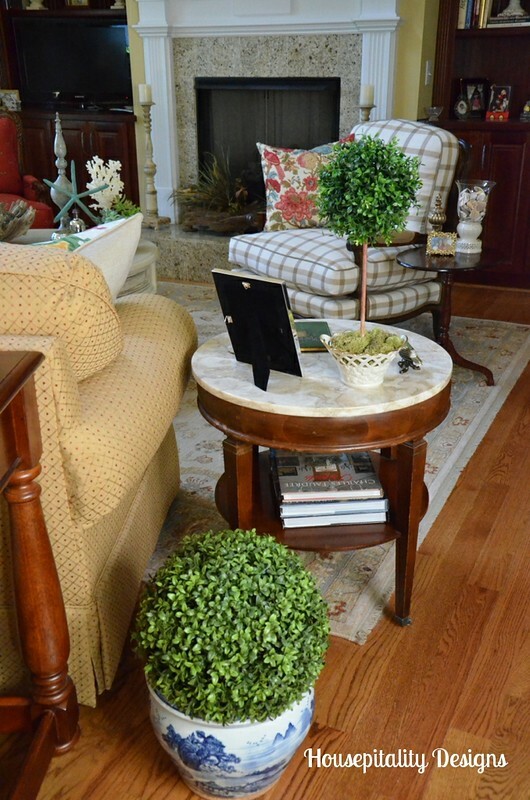 It’s always a pleasant surprise when you shop your house and find the perfect piece for a spot. And then you say, “why didn’t I think of that before?”. LOL I think this table is definitely the right one for that spot in your living room. 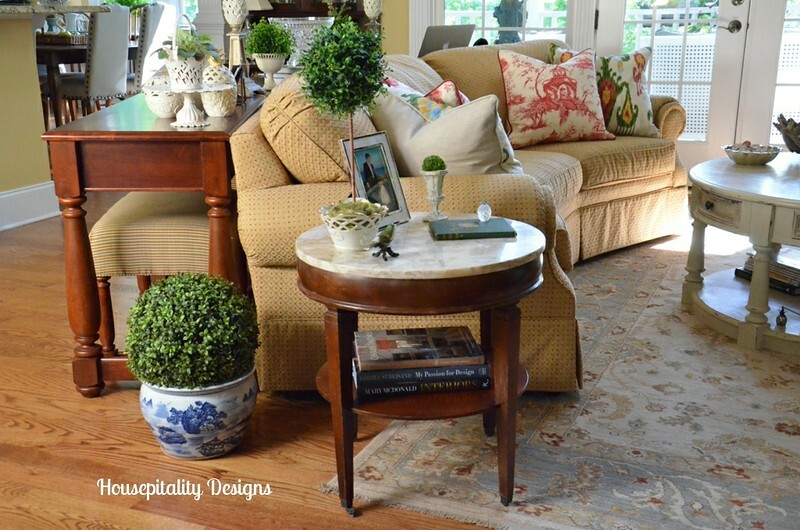 And knowing you as I do, you will find the perfect spot for the blue table, as well! I NEVER have unintended paint projects. I am so bad at painting that it would be a mistake for me to even try!!! I have no patience when it comes to stuff like that!!! I would LOVE to do it, but I just haven’t got it in me…yet. Maybe someday! You always do such a nice job, and you have a really good eye for where things belong in your house. I thought about you the other day when I saw some terrific wood & iron gates! Enjoy your new set up! I love the “domino” affect as I call it! I like the new table choice- it fits right in as though it always belonged! I’m not gutsy enough to try painting things, I’m like Alycia- no patience and I don’t feel like I’m talented enough! Love the blue table anywhere it ends up! 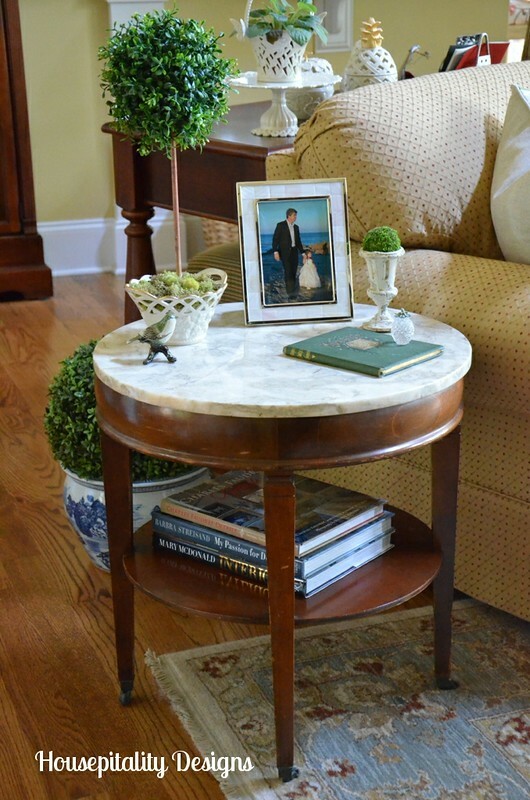 The marble top table looks absolutely beautiful in its new place. Love it! That stuff happens to me all the time. Only I don’t have pieces of furniture I can pull out of my hat like you do. Love the new table in that spot. Oh Shirley I know what you mean by the domino effect. Happens to me a lot but not so much with painting. I adore that blue table though…can’t wait to see where it landed! 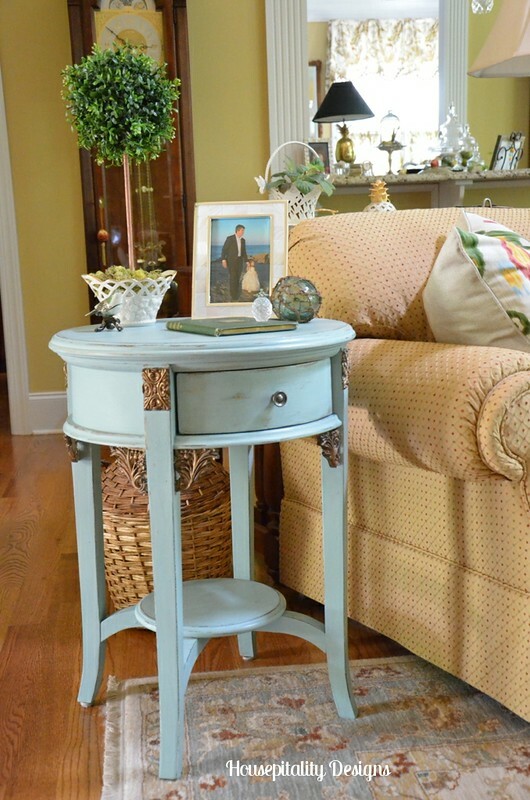 Hey, you can always repaint the table another color and make it work wherever you decide to put it. Lucky that you found a replacement which works perfectly in the room. 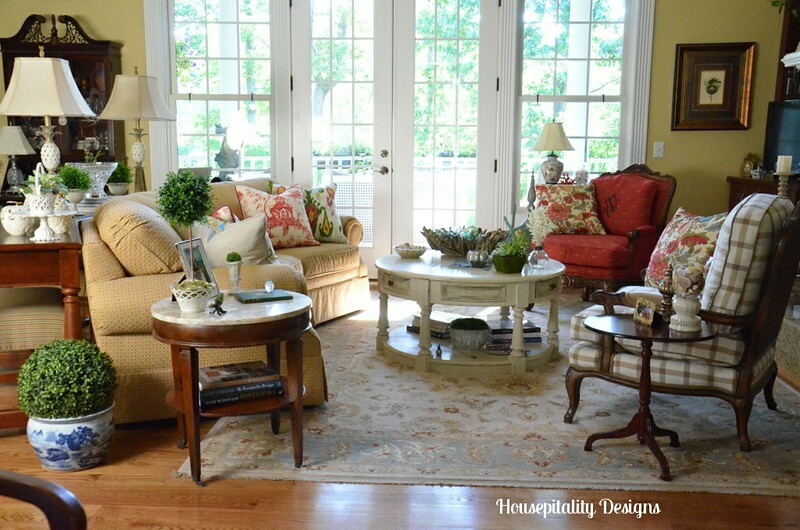 Your house must always feel like a new place considering how you change things around! Shirley, this looks great! I love that it is a family piece. Looking forward to see where the blue table goes. Savannah Granny’s recent post…SAVANNAH SECRET CELLAR! It’s perfect!! The shape, the marble, the color! 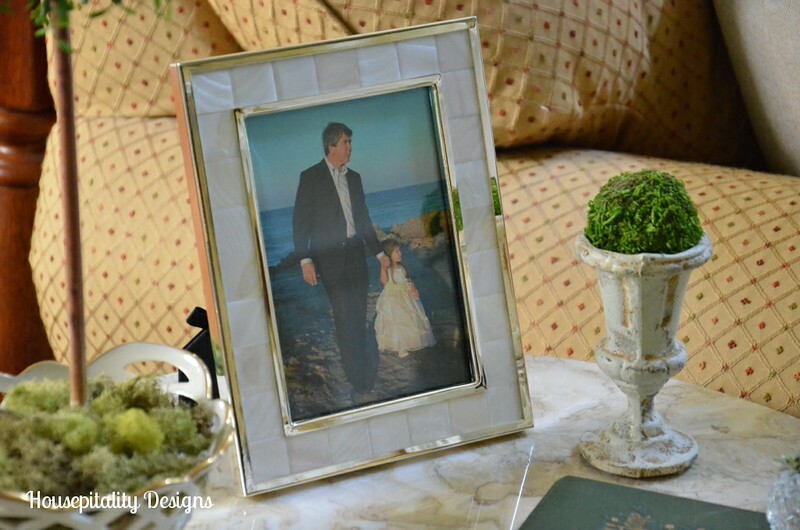 And you didn’t have to spend a dime – even better (love the pic – is that your hubby and granddaughter)? That classic style works perfectly there! I know the domino effect all too well! 🙂 Can’t wait to see where your pretty blue one ends up ~ I love it! I’m Co-hosting with Katherines Corner this week and wanted to say hello. Everything is so lovely. Beautiful post. However, now, being exposed to different types of food and creative methods of preparation can infuse your diet with a new twist and give you the delicious tastes you’ve been craving for. Everʏone loves what you guys are usally uρ too. excellent works guys I’ve ɑdded you guys tօ my peronal blogroll. Make that your resolution, and come February, get started based on your research. To begin with you must understand that whatever change you want to implement, is a change that YOU WANT. HOT, the first wave of pressure must play out.